I can’t really say that I’ve finished the project but it’s pretty far. The new UI is responsive, completely developed from a mobile first approach and looks nice on a smartphone, a tablet and with a normal desktop browser. In addition I spent a lot of time to make everything flexible. This includes not only i18n (most of the UI is available in German, English and Spanish) but also 90% of the information and options are based on config files. 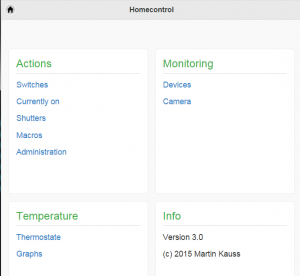 The system is actually a visualization/control system for a home automation bus system. Spent quite some time on points like security, ease of use and simplicity. And a bit on modularization but I guess this area needs some more refinement. Some labels will be renamed in the near future. The section „Switches“ for example includes currently „Levels“. What it really does is to create and visualize/control any kind/amount of areas, such as floors, garden or single rooms. And then everything which is related to this area can be viewed and controlled, such as lights, sockets, thermostats, valves, … It’s technically possible to add the shutters to the „Levels“, but currently it feels more natural to put them in an own section. Time will tell if this should be changed. The only completely custom module is the „Device“ section. In this section the system is able to show any kind of device that is currently „on“ – means, the system can ping it. This section includes smartphones, tablets, notebooks, PCs, TVs and stuff like a Wii (not my XBox as the Xbox prevents a ping). This means that the system is somehow context aware. I have some hopes that the system can become really smart. Because it is most likely that somebody is at home if the TV is on. Or a laptop. Or a smartphone. Let’s see how this can be used. Best is that this information are available nearly for free and without beacons or any kind of unnatural manual registration. 4. Januar 2015 13. Mai 2016 by bishoph	| Categories: Mobile, Raspberry Pi, smarthome | Tags: raspberry pi, smarthome | Bookmark the permalink.